A powerful and stable software to manage hard drive and partition without data loss. Supports Windows 10/8.1/8/7/Vista, XP and Windows 2000 (All Editions, 32/64-bit). 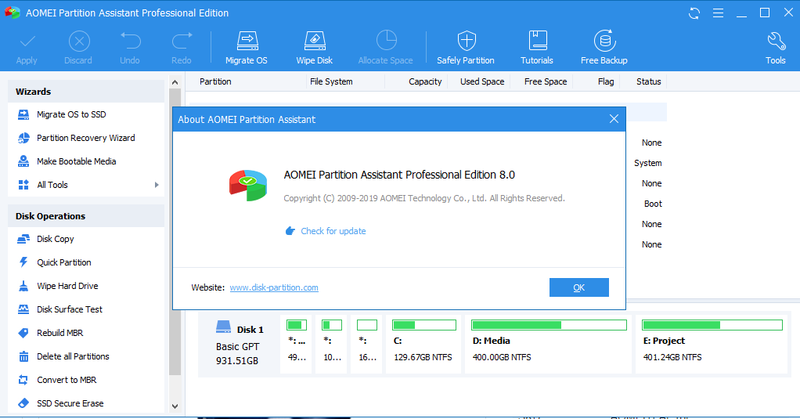 AOMEI Partition Assistant (PA) Professional is a Windows disk manager that can help you manage disk space with high efficiency. Not only it’s easy to keep your growing data well-organized in the limited disk space. Also, it offers more advanced fatures: migrate OS to SSD/HDD, format/wipe/erase disk, recover lost partition, SSD 4K Alignment, etc. adjusts the size of partition or move the place of partition without data loss. Merge unallocated space or two adjacent drives into one partition. divides one comprehensive partition or disk into many smaller partitions without data loss. allocates free space from one partition to other partitions without data loss. makes partition align to improve the speed of reading and writing. Convert file system among NTFS, FAT32, and FAT without losing data. Convert disk flag between primary and logical without quickly and safely. Copies data from one disk or partition to another easily and fast. Recover the accidently deleted or lost partitions to get back lost data. Create a Windows PE bootable CD/DVD or USB without installing Windows AIK/ADK. Make a portable Windows 7/8/10 system on USB flash drive without Windows 7/8/10 Enterprise. 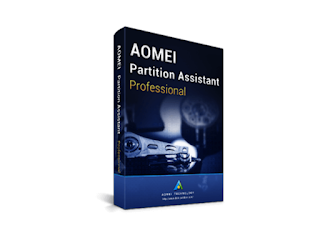 Integrate AOMEI Partition Assistant or AOMEI Backupper into Windows built-in recovery environment. Securely erase your SSD to reset the SSD to its factory state for peak performance.